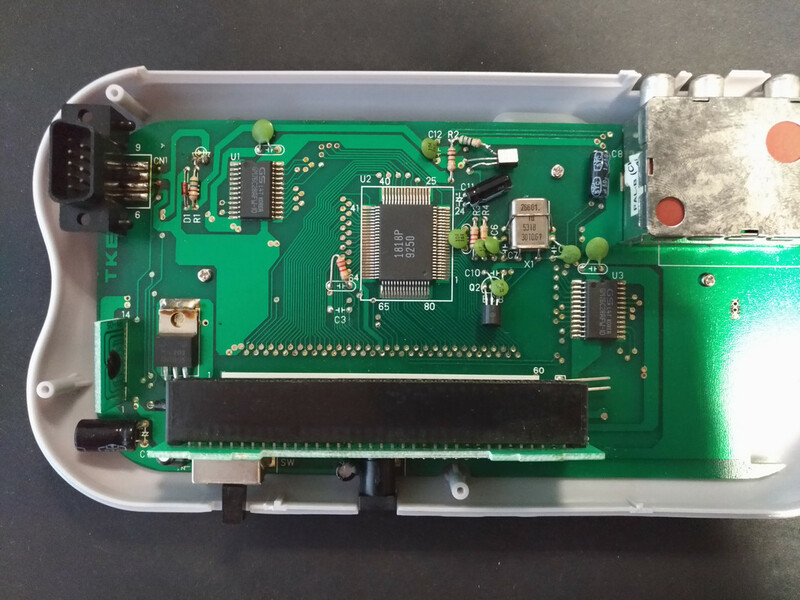 It is a portable console, with no LCD screen and the player 1 is the console itself. 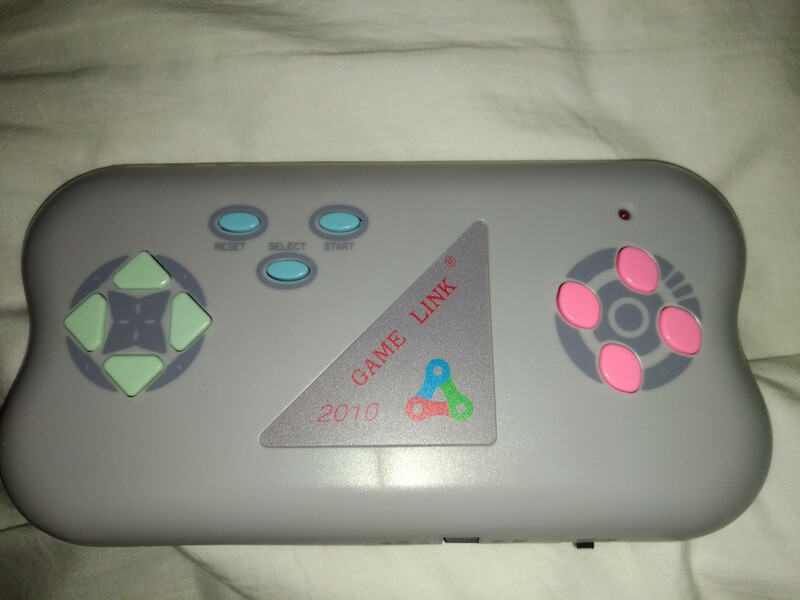 For the Player 2 there is a 9 pin port on the side. My problem is, i wanted to know how can i put an external player 1 port, so that i don't have to play with this enormous controller on my hands. 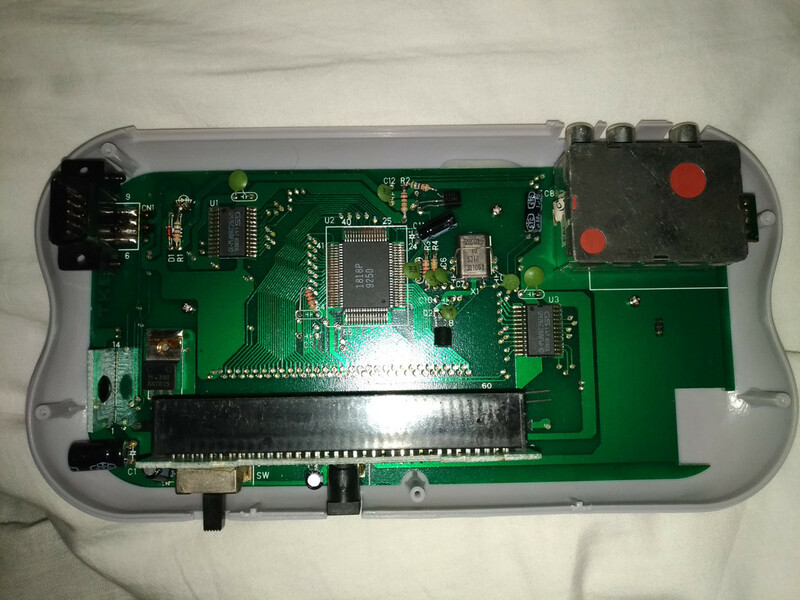 I have an 8Bitdo SFC30 Gamepad Bluetooth and the respective receiver (NES ans SNES style) so that i can play from a distance. 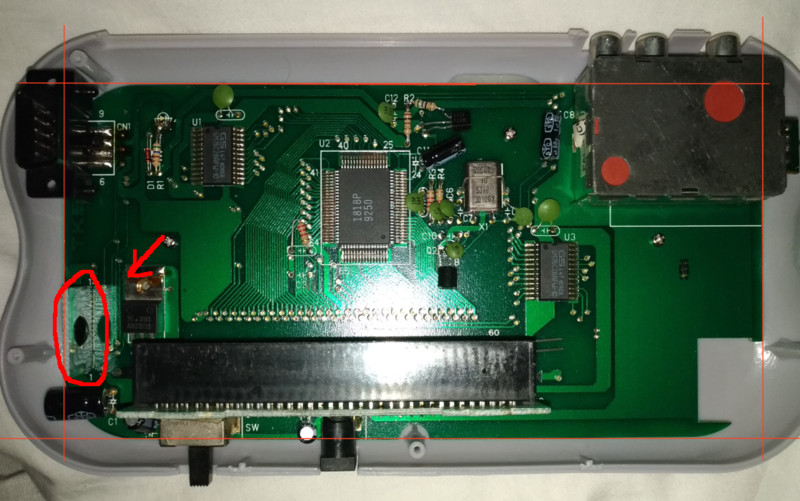 1) Switching the player 1 with the player 2 port (Rewiring pins on the inside) so that i can use the external port as the player 1. 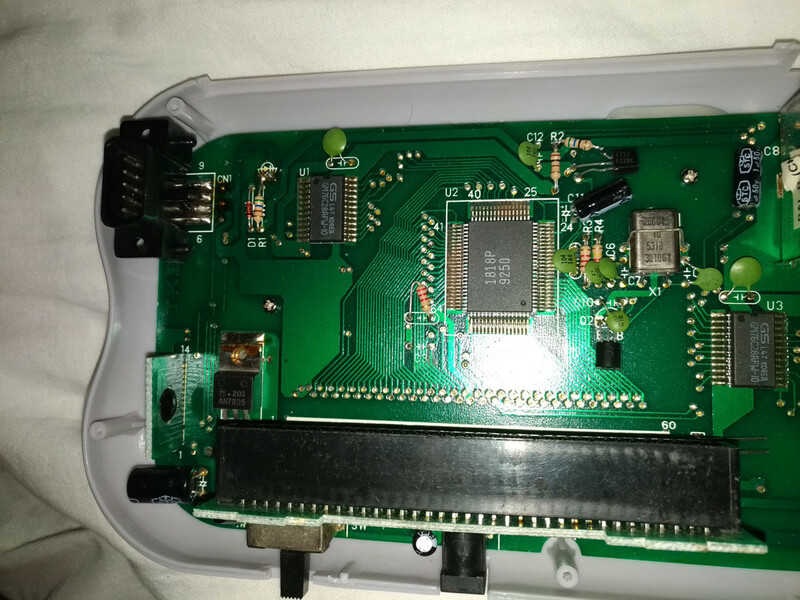 2) Use the NES controller port pinout as a reference and try to find WHERE in the console PCB are located the 5 pins needed (Vcc, Ground, Data, Latch and Clock). I did A LOT OF RESEARCH but found nothing to guide me in my journey. Can someone has an idea for me to go on ? P.S: Simply buying an original NES console is out of the question as they can go up to 100 euros and even more in my country. The "GS GM76C28A" parts appear to be 2Kx8-bit SRAMs made by GoldStar (now LG), one for the CPU and one for the PPU. 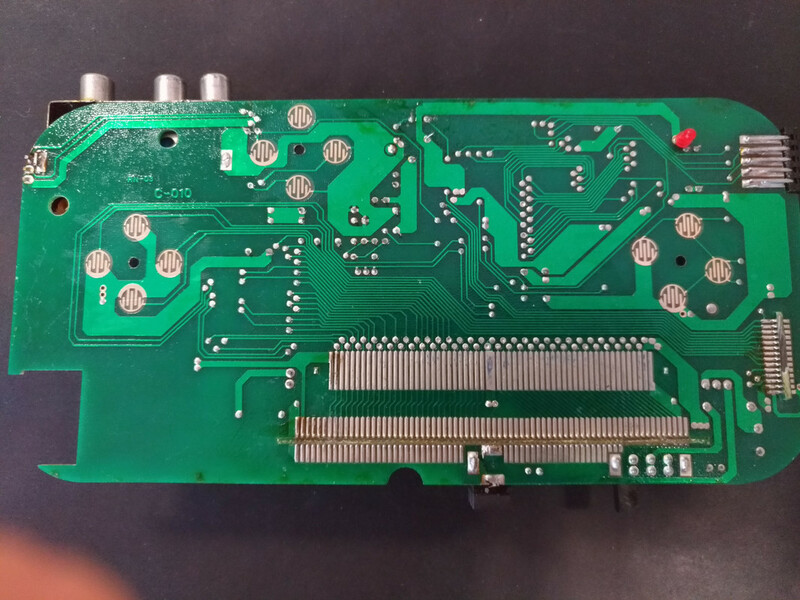 Could you photograph the other side of the board? 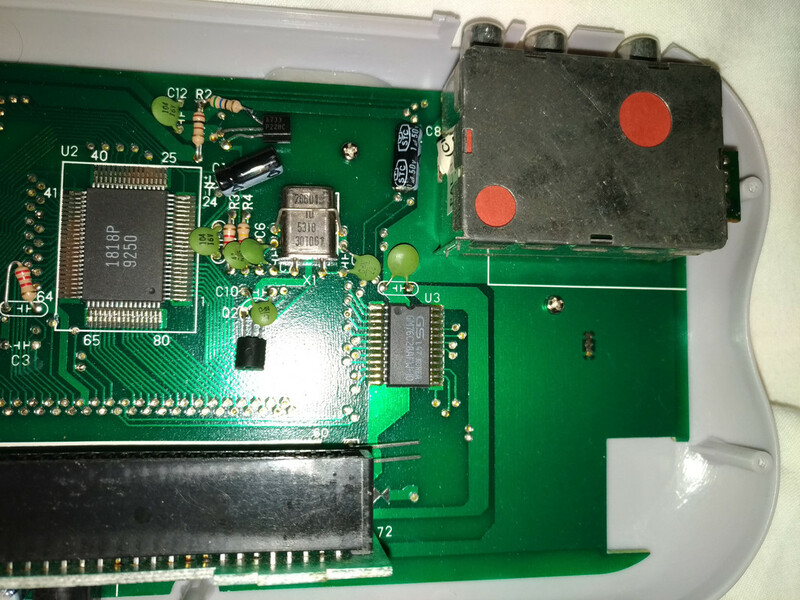 The encoder for player 1 might be there, with a part number resembling 4021 or a 74165. Ty for your input. As soon as I got home I will take the pictures you required. Thank you. Though there aren't any ICs on the button side, it should help someone trace out the input logic. Sorry but neither of the photos is suitable for rev-eng process. THe one with chips has too much dark spots on the edges + the flash reflect makes it unusable. The second one is not sharp enough in sope places (all horizontal traces seems to look like one polygon). Please make one good photo of top and one good photo of bottom side that it sharp, bright enough and includes the whole PCB. And Data/Strobe/Clock goes out as well as +5V and GND which makes 14. 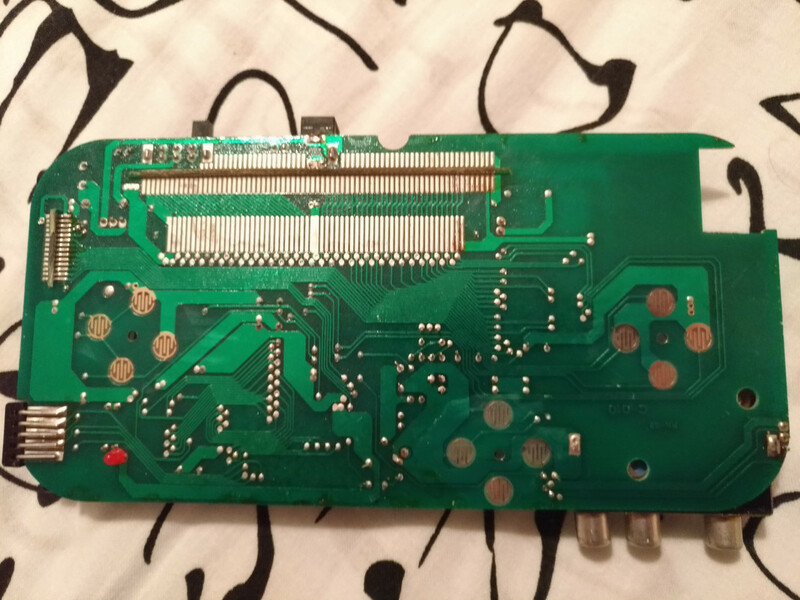 First players button goes there so it is probably some shift register chip that is present in regular joypads. 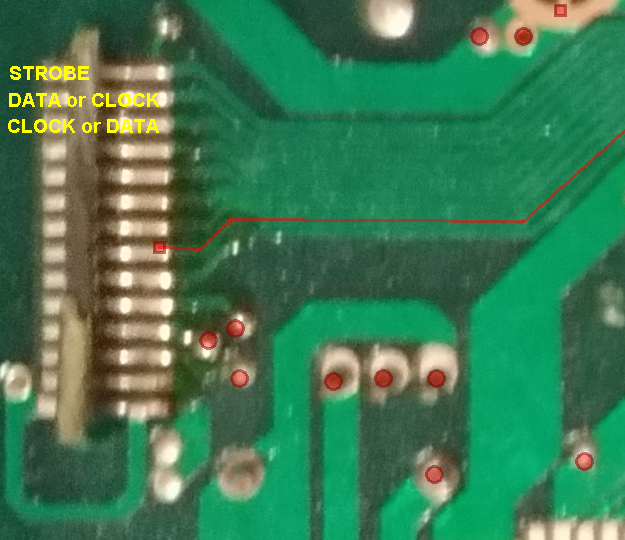 Have in mind that soldering Data/Strobe/Clock/+5V/GND from the external jopad here is not good idea - data line will be shorted. You should AND the data lines. Just one question though. In the very last phrase you wrote, isn't there a missing word ? I didn't understood why the Data line would be shorted and it appeared you were telling me a workaround for this exact fact but something must have been lost somehow. 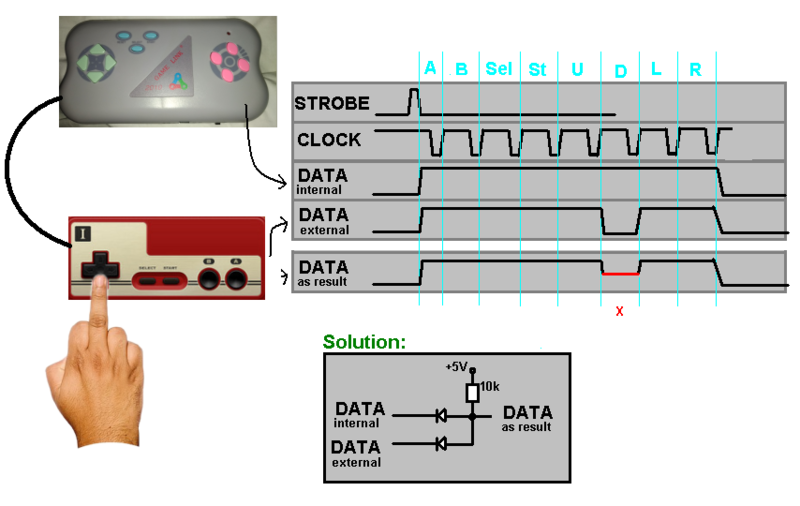 If you wire both datas together and press for example down button on the external pad, both pads will try do output diferent waveforms when polled by console. Because DATA line is not open collector, it will cause shorts. Sorry for the late reply, it was hard to take a good picture, with a better phone without having one on hand. Internal 1st joypad in your clone is that little PCB. You should deal with it if you plan to attach external one.